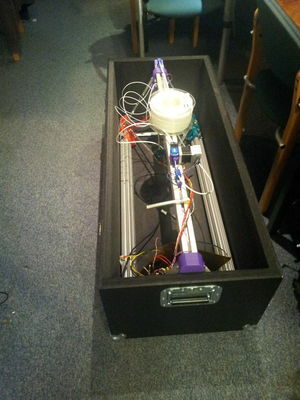 Building a proper flightcase for a Cerberus-derived delta 3D printer. It ought to be flexible enough to house both the newer -printed- model and the original model in ways that even rough treatment will likely be survived gloriously. Find ways to keep weight limited so it can still be carried by a single person. Used 9mm plywood. Strong and light. Determine how to best design inside of case to accommodate the different variations of the cerberus. Find some way to cut foam into arbitrary shapes A sharp knife works wonders; No need for a hot wire cutter at all. Find affordable sources for support foam and 'hang en sluitwerk' plus wheels. Ordered at zelfbouwcase.nl, very happy with 'em. Cheap non-birch 9 mm plywood; good compromise between price, sturdyness and weight. Found wheels and butterfly-lock-thingies in my attic. Ordered pre-cut 'hard foam' at zelfbouwcase.nl, so possibly avoided cutting it myself. Make calculation mistakes so had to cut it. But it's easy. Protection will basically be just a tight fit inside between 20mm hard foam plates and some strategically placed additional hard-foam buffer blocks. All materials ordered and received, just need to move foam plates to TI by bike. Bottom half of case made, glued. Next up is painting. Only after painting can wheels etc be mounted. Top half is under way. It bends a bit too much, so it may need slight redoing or adjustment. If you need to mount metal corners and wheels, NEVER mount the wheels first; they'll end up in the spot where the corners needed to go! Never glue the hard foam on the inside before drilling all the necessary holes for the rivets; the drill might catch on the foam, even if unlikely. Hard foam is completely different from soft foam; the former is actually VERY easy to cut with a sharp knife. Contrary to popular belief. I found out, belatedly, that the glass bed sticks out more than 2 cm which is the thickness of the bottom foam. So the gap I cut isn't quite enough. To address this I cut and glued four ~8mm thick pads underneath the four supports. I hope this helps enough. Seeking good ways to fix/hold stuff (like accessories, power supplies, etc.) in place inside the case I fancied using flexible rope/cord. But how to fix it, if having a number of knots outside the case is a NO-NO? I got my eureka moment when I thought of pulling the rope though a 5mm hole, putting a rivet there, and cutting the rope off making it invisible from the outside (just seeing the rivet). It seems to work like a charm. Using this trick and others, the case now has supports and fixations to safely carry: the PSU, a 14" laptop, the laptops PSU, and a bunch of cables and/or power bars etc. Also: 3x spare diagonal rods. I'm still looking into more of these storage locations, but the lack of suitable foam, foam-glue and time limits me somewhat. So that might just be for 2015. This page was last edited on 7 December 2015, at 01:01.